I’ve had a few customers contacting me recently regarding bogus domain notices received via email. This type of scam has been around for years and is sometimes delivered via postal mail as well as email. The scammer may be actually trying to get you to register a different domain at an inflated price or they are simply trying to sell you a service you don’t need by tricking you into thinking your domain is about to expire. If it’s a new domain they are trying to sell, it will most likely be similar to your existing domain name and their hope is that you won’t notice. In the worst case they will try to get you to transfer your domain to their control and you may even lose it. 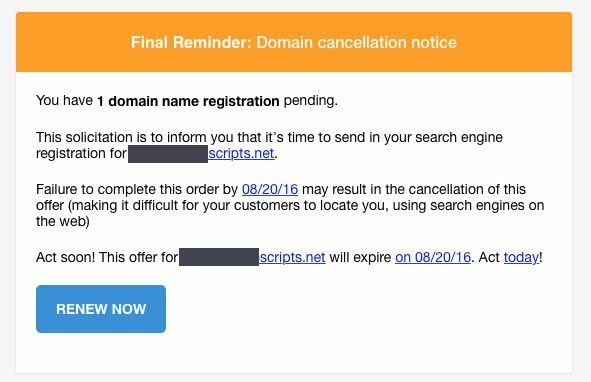 This important expiration notification proposal notifies you about the expiration notice of your domain registration for yourdomain.com search engine optimization submission. Many people see the part that says ‘This important expiration notification proposal notifies you about the expiration notice of your domain registration for yourdomain.com‘ and click the ‘SECURE ONLINE PAYMENT‘ link before realising that it’s just another scam. After all, it DID come from ‘Domain Registration Service SEO Company’. The important info (including the fact that they say you can opt out by written request but don’t actually provide street addresses) is in the wording – search engine optimization’ and the small print in the footer. Here’s another one that has been doing the rounds recently. Your IT department – if you are working for a medium-large company then they should be taking care of this anyway! Your web designer – quite often the person who designed your website also registered your domain. Your web host – if you know the company that hosts your website then forward the email or give them a call. If they don’t know they will still be able to very quickly spot the scam. Your ISP – if you have bought a ‘bundle’ that included your domain.